Figure 3 Bosniak Category II hyperdense cyst. (A) Homogeneously hyperdense mass measuring 60 HU without intravenous contrast. (B) After intravenous contrast the mass did not enhance (61 HU). Abbreviation: HU, Hounsfield unit. Figure 4 Bosniak Category IIF cyst. Cyst with several internal septations and a minimally thickened wall. Figure 5 Bosniak Category IIF cyst. 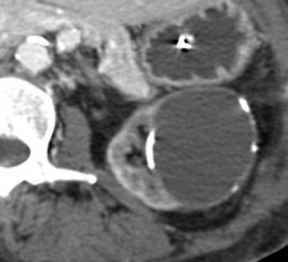 Cyst with uniform, mild wall thickening and short, interrupted calcifications. 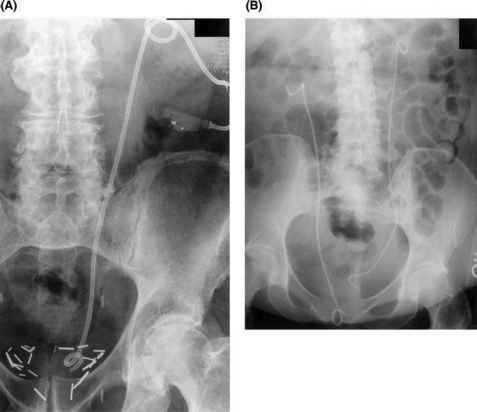 Internally, the lesion was homogeneous, was of low attenuation, and did not enhance with intravenous contrast. Figure 6 Bosniak Category III. (A) A 63-year-old male with microhematuria, left flank pain, and a history of prostate carcinoma. 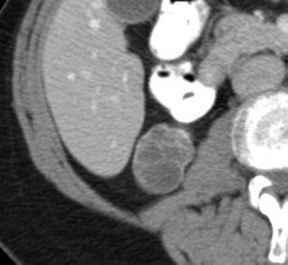 CT shows a cystic mass with irregular wall thickening and associated heterogeneous nonenhancing elements. 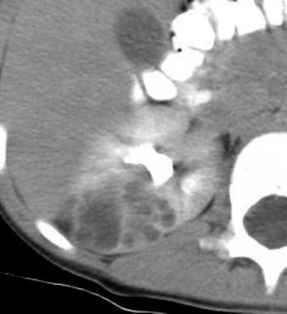 (B) Scan caudal to (A) shows thickened internal septa with associated calcifications, a calculus in the proximal ureter, and perinephric stranding. Xanthogranulomatous pyelonephritis at surgery. 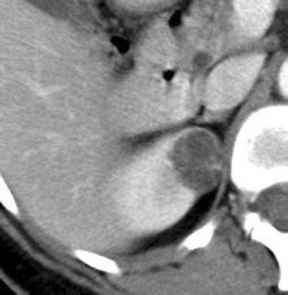 Abbreviation: CT, computed tomography. Figure 7 Bosniak Category III complex cyst. Four-year-old male with gross hematuria and a multilocular, encapsulated mass. Multilocular cystic nephroma at surgery. Figure 8 Bosniak Category III complex cyst. 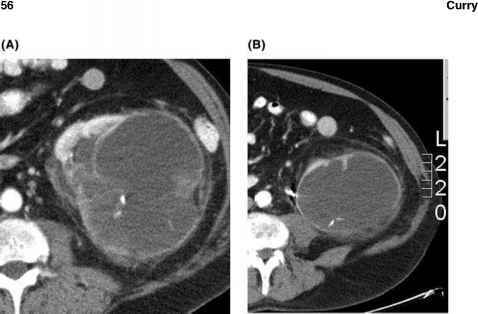 A 66-year-old female with incidental mass. Thick-walled, encapsulated, multilocular cystic mass with enhancing septa. Clear cell carcinoma at surgery. score of 1.4. Nineteen Category IIF lesions scored the highest at 3.1. Twenty-five Category III lesions were intermediate at 2.1. 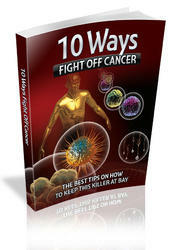 Five of the 22 Category II and IIF followed-up group showed slow increases in the extent of calcification over an average of five years. The pathologic correlation available for 21 calcified Category III lesions yielded 11 benign hemorrhagic or infected cysts, nine renal cell carcinomas, and one multilocular cystic nephroma. The conclusion of the study was that calcification in a cystic renal mass, even if thick and nodular, is not as important as the presence of solid enhancing elements associated with it. If no soft tissue components are present, even relatively heavily calcified cystic masses can be followed safely (Fig. 11). Neither slow growth nor increase in amounts of calcification should cause concern (Fig. 12).